Designing and growing your own container garden is a lot easier than you think. It’s amazing how much you can accomplish with a well-chosen combo of pots and plants, from jazzing up your patio to growing herbs and vegetables in small spaces. Once you’ve figured out what you want from your container garden, it’s time to get inspired. Luckily, ideas are everywhere. If you’re inspired by the prairies of the Midwest, recreate your own home on the range by pairing ornamental grasses and wildflowers with a rustic whisky barrel container. Want a tropical getaway? 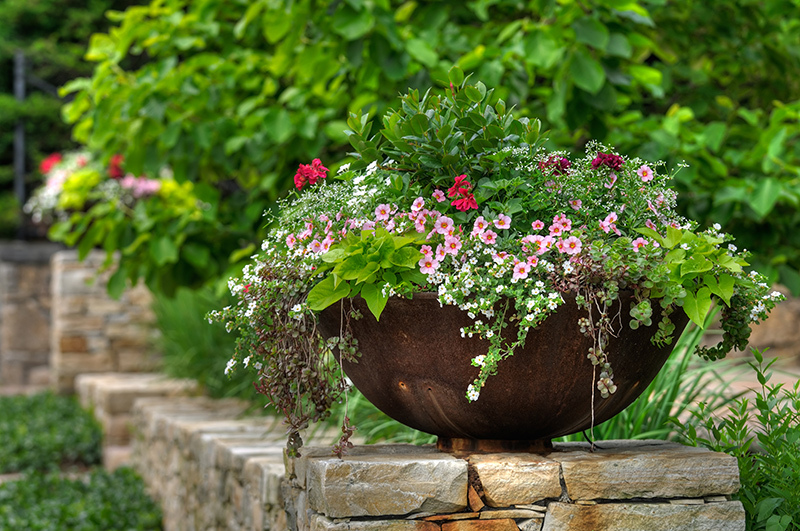 Fill a colorful pot with a ti plant, hibiscus and an ornamental sweet potato vine to trail over the pot’s edge. You can even grow creative combinations of herbs, fruits and vegetables, such as a pineapple plant with strawberries and thyme draped over the edge. For a quick burst of frost-resistant spring color, use annuals like alyssum, petunias, dianthus and violas — and combine them with bold perennials or shrubs to add height and drama. Since you’re trying to create the look of a real garden, use a variety of plants with colorful flowers and attractive foliage to build up layers of different heights. 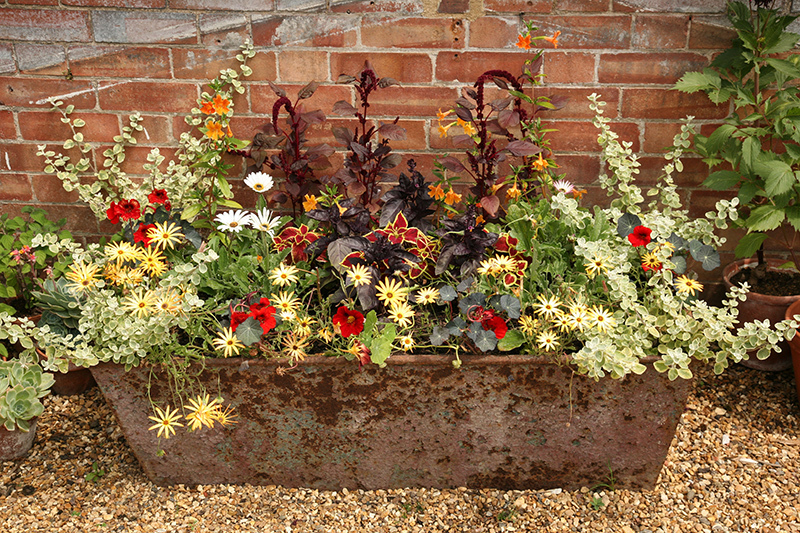 Usually container combinations use three different types of plants to serve as thrillers, spillers and fillers. Thrillers: Dramatic and bold, these tall plants usually rely on foliage to become the focal point. Examples include yucca, ornamental grasses, cordyline and cast iron plant. In larger combinations, these plants can even be used as fillers. Spillers: Draping over the edge of the pot, spillers create a softening effect. Spillers to consider include petunias, alyssum, ornamental sweet potato vine, creeping Jenny and dichondra. If it trails, you cannot fail. Fillers: Full and flowery, fillers fill the space between plants. What you use depends on the size of the pot, so choose plants that won’t grow taller than the plant you choose to be a thriller. There’s more to choosing plants than just using those that look good together — they have to live well together, too. Some need full sun to bloom their best, while others will get burned unless they’re grown in shade. Full sun: Needs more than six hours of sun daily. This category is the most versatile and includes most annuals, perennials, vegetables and herbs. Part shade: Likes four to six hours of sun per day. 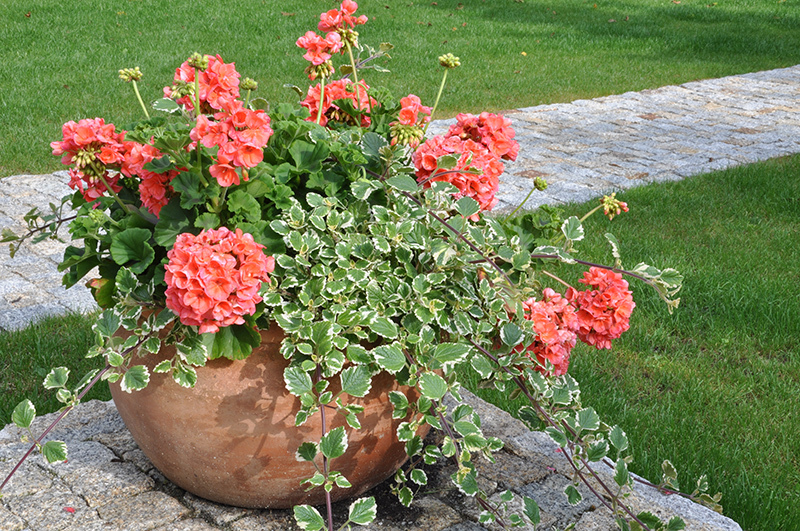 Good plants for part sun include heuchera, impatiens, begonias and coleus, though these will also work in full shade. Full shade: Requires less than four hours of sun every day. Caladiums, fatsia, ivy and most houseplants and foliage plants thrive in low light. Another consideration when pairing plants for a container garden is moisture, though it’s a bit easier to control than the sunlight you receive. 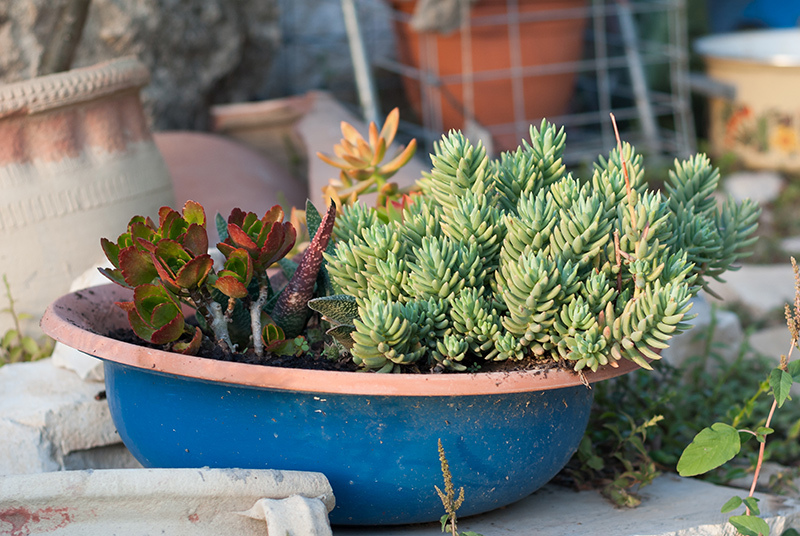 If you have a hard time remembering to water your plants, grow drought-tolerant annuals, perennials and succulents. An arrangement with a dramatic yucca surrounded by blooming portulaca and colorful sedum is low maintenance and high impact. You can also add peat moss or coir to your potting mix before planting to help the container retain moisture. Whatever you do, though, choose a container with a drainage hole so the water can escape without stagnating and rotting your plants. Creating a container garden is so easy that the youngest of kids can help do it. Water the plants you’ll be using so their roots won’t get damaged during planting. Fill a container almost all the way to the top with potting mix, leaving just enough room for the plants and their roots. Knock the plants out of their pots, gently tease some of the roots apart and arrange them in the pot. Fill the gaps with more potting mix so it’s level with the plants’ soil surface. Remove any excess potting mix. Water thoroughly so the potting mix settles in. In most cases, caring for your garden is as simple as watering the plants before they wilt, trimming stems to keep the arrangement tidy and, in some cases, removing spent blooms to encourage more flowers. However, if you plan on keeping your container combination together for more than one year, use a time-released fertilizer to keep plants healthy. When plants outgrow their space, just remove a few and fill the hole left behind with potting mix for the remaining plants. When flowers start to decline, replace them with new ones and fresh soil. When properly managed, a container garden can last for a very long time.